Co-hosts for the event Kathy O’Hearn, Carol Melton, Heather Podesta, Megan Murphy, Holly Peterson, Hilary Rosen, Tammy Haddad. Photo courtesy Haddad Media. For one night only, The Jefferson hotel was ground zero for all the Hamptons action! 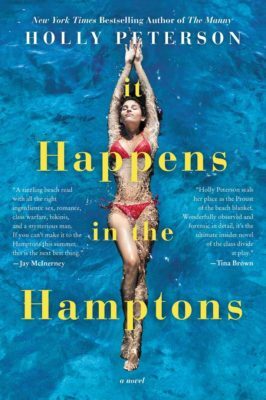 BLOOMBERG Business week editor-in-chief Megan Murphy interviewed journalist and bestselling author Holly Peterson on her new book it Happens in the Hamptons. 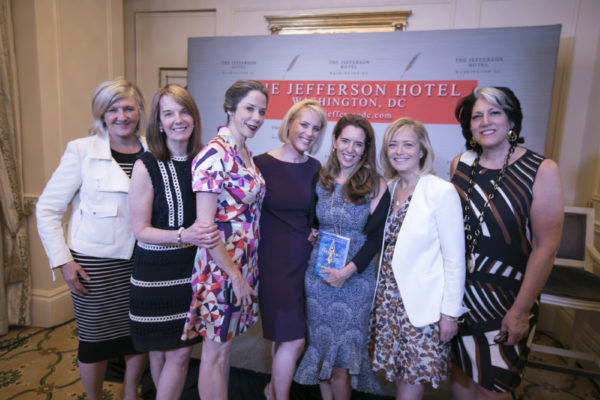 Connie Milstein and co-hosts Carol Melton, Hilary Rosen, Heather Podesta, and Juleanna Glover, gathered the DC elite at the historic hotel. 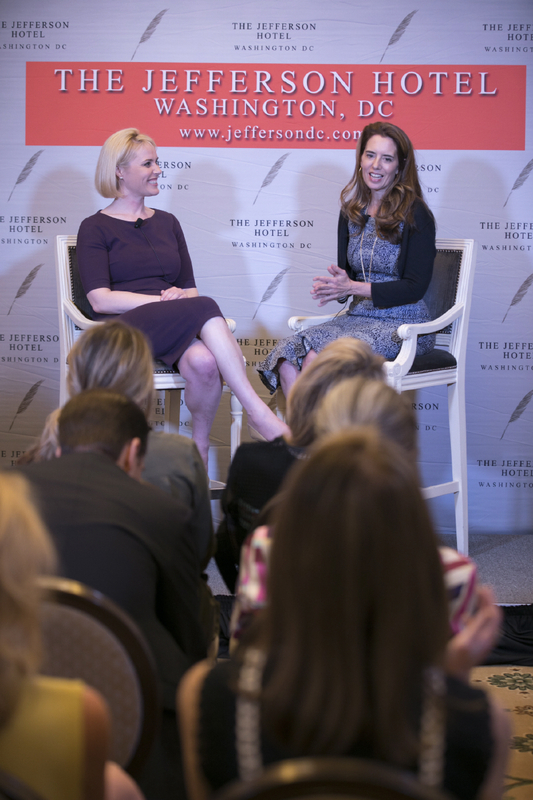 Guests included Rep. Debbie Dingell, Maureen Dowd, Sally Quinn, and Ms. Peterson’s first boss, Bill Knapp. 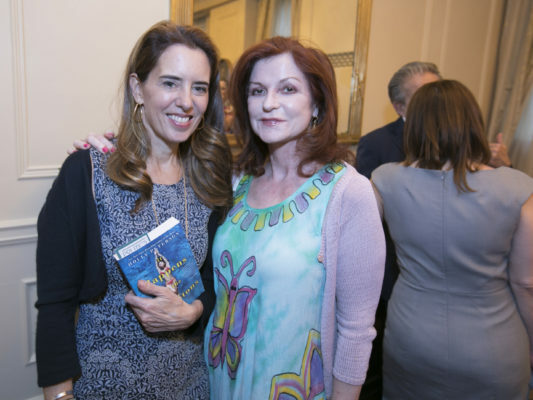 Holly Peterson and Maureen Dowd. Photo courtesy Haddad Media. Ms. Peterson discussed the disparity between the glamorous island’s haves and have-nots. She also discussed finding harmony in such a polarized place, recounting her time learning to surf with locals and the unique culture of Southhampton. Guests picked out Hamptons flip flops and buzzed about the announcement of an independent counsel right as the standing room only crowd. Megan Murphy and Holly Peterson on stage at The Jefferson Hotel. Photo courtesy Haddad Media. Spotted: Daniel Lippman, Ryan Williams, Stephanie Cutter, Robyn Bash. Kate Goodall, Tom Forrest, Jonathan Capehart, Ann and Lloyd Hand, Betsy Fischer Martin, Polson Kanneth, Heather Lauer, Anita McBride, Tina Tchen, Melissa Moss, Ryan Williams, Becca Glover, Alyse Nelson, Rupert Allman, Su-Lin Nichols, Sissy Yates, and Jayne Sandman.